Dhaka, 28 Jan, Abnews: The second span (superstructure) of the much-hyped Padma Bridge was installed on pilar number 38 and 39 this morning in the district. With the installation of the second span around 8:30am, a total of 300 metres of the Padma Bridge is now visible, said the engineers concerned. The first span was installed on September 30 in 2017. 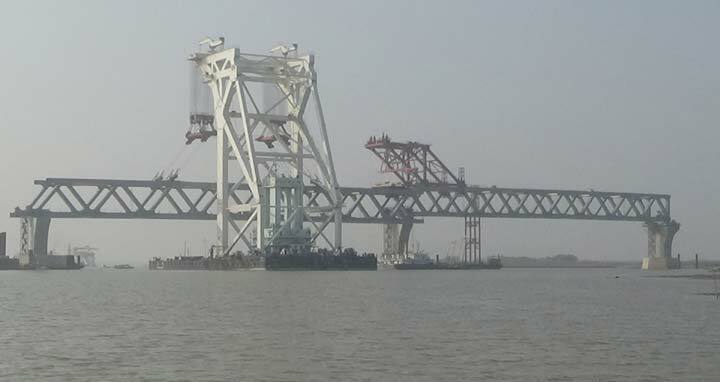 Reliable sources said more than one span would be installed in coming month. Earlier on Saturday, the second span of the bridge could not be installed due to the depth and strong current in the river. The government is constructing the bridge with its own fund. The construction work of the long-cherished Padma Bridge started in December, 2015 and it is expected to end by December of this year.